UCSD loses to Humboldt State but rebounds to upset CPP. 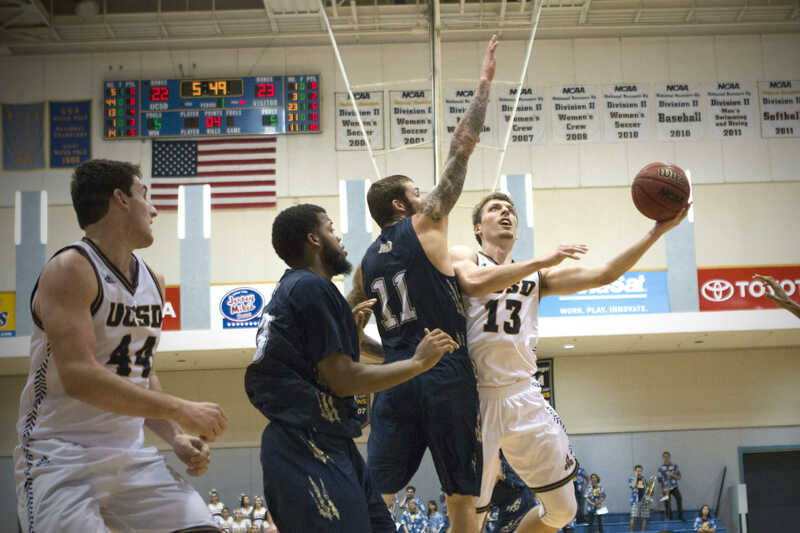 The UCSD men’s basketball team headed into the new year as No. 13 and on a two-game winning streak. Unfortunately, unranked Humboldt State broke that streak, but the Tritons rebounded against the undefeated No. 5 Cal Poly Pomona the very next night. The Tritons are now an impressive 10–2 overall and 5–1 in California Collegiate Athletic Association play. Ninety-three seconds into the game on Friday night, the Tritons found themselves down 2-7 against the Humboldt State Lumberjacks. Within minutes, however, the Tritons tied the game off of a three pointer by senior forward Drew Dyer. But three quarters of the way through the first period, the Tritons found themselves down 11 points, only to battle back and tie the game once again just minutes later. This sequence of events defined the night for the Tritons: allowing the Lumberjacks to pile on points but then quickly climbing back. The night did not end in the Tritons’ favor, though, as the Tritons could not return from a 25-point deficit with 11:48 left in the game. But remaining true to the plot of the night, the Tritons made it interesting, once again furiously battling back to within five points with 1:49 left in the game. Alas, the Tritons could not break the trend, as the Lumberjacks won 82–72. The night was not without its bright spots, however. Junior guard Adam Klie helped to keep the team afloat with 15 points in the second half, ultimately finishing with 19 points, three assists, seven rebounds and three steals. Also key to making the game close at the end were Dyer and freshman center Chris Hansen, who contributed eight second-half points each. The Tritons’ defense could not contain the red-hot Lumberjacks, allowing them to shoot 49.2 percent off of 59 shots, while the Lumberjacks stifled the Tritons’ offense, holding them to 39.4 percent off 66 shots. The Tritons fell to 9–2 overall and 4–1 in the conference, while the Lumberjacks improved to 10–1 and 4–1 in the conference. Luckily for the Tritons, their fortunes improved on Saturday night. Clearly learning from the previous night, the Tritons never trailed by more than four points in a back-and-forth first period. Highlighted by five tied scores and six lead changes, the Tritons played against the No. 5 Cal Poly Pomona Broncos. Keeping the first period close, Dyer and junior guard Aleks Lipovic scored 11 and nine points, respectively, to make it a close 32–36 game at the half. In the second period, the Tritons finished the job they could not the night before. Once again, Klie turned it on in the second half with 13 points, eight rebounds and four assists to allow the Tritons to surge back and lead by as many as 11 points. Dyer kept his hot streak going, scoring 12 points and grabbing five rebounds in the period. The Broncos, however, did not go down without a fight. Sophomore forward Jordan Faison scored 20 second half points and brought the Broncos within two points in the final minute. But thanks to final free throw shots by Dyer and sophomore guard Grant Jackson, the Tritons held on to win 72–69. Dyer finished with a stellar 23 points and nine rebounds, while Klie finished with his second double-double of the season with 15 points and a career-best 12 rebounds to go along with another career-best seven assists. Hansen and Lipovic also finished with 14 points apiece. The Tritons’ bench did not score a point in the game, but 11 three-point shots were able to lift the Tritons and their 39.7 percent overall shooting percentage above the Broncos. The now 10–2 Tritons handed the Broncos their first loss of the season, with Cal Poly Pomona fell to 12–1 and 5–1 in conference play. The Tritons will travel to Northern California to play San Francisco State on Thursday, Jan. 7.